Add remarkable height and design to several sections of your landscaping using these Panacea Chestnut Brown Regency Trellises. Dual arches, twisted wire, and flower shapes combine on each striking piece for drama and unique style in your yard. Square steel forms both an outer and inner arch for a generous frame, and also creates two, 12" long legs for easy placement in soil. 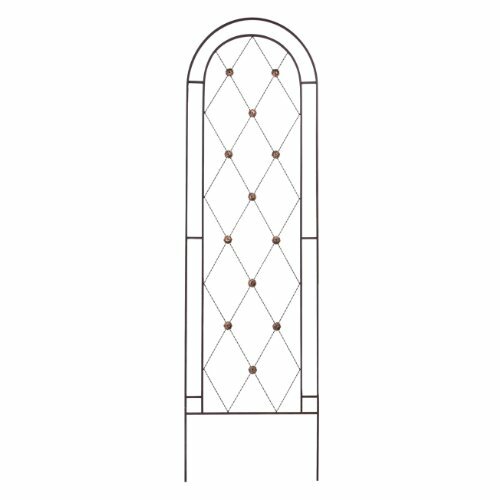 Twisted steel wire forms a diamond-shaped lattice within the smaller arch, and floral medallions at each intersection enhance the natural look throughout your yard. Not only does the open lattice on each capture attention; it also offers several climbing plants support as they grow for a healthy and lovely garden. The brown color throughout the units meshes with the outdoors, and bronze accents on each medallion are sure to gleam in the sun. The steel construction remains durable, while the arches on each add a timeless hint to your area. Bring classic style and support to several of your plants with these Chestnut Brown Regency Trellises. This case pack includes 5 of the Panacea Regency Trellises, Chestnut Brown, 84"H.